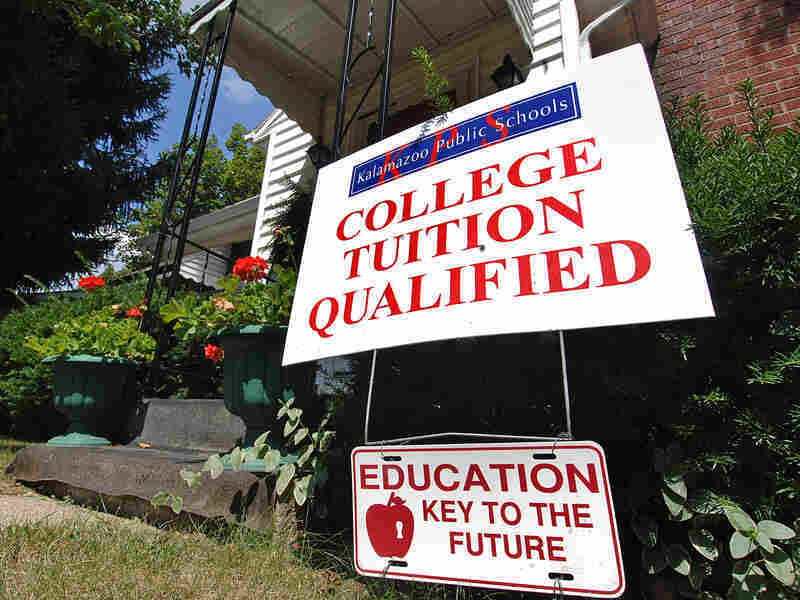 How One Michigan City Is Sending Kids To College Tuition-Free In 2005, a group of anonymous donors in Kalamazoo launched a bold program. It pays for graduates of the city's public schools to attend any of Michigan's public universities or community colleges. The Kalamazoo Promise, a full-tuition scholarship program announced in 2005, created a stir in the city when it launched the following year. Paying for college presents a tremendous hurdle to many families, from wading through paperwork and navigating financial aid to understanding the long-term implications of college debt. But what if the city you lived in footed the bill for college? That's what Kalamazoo, Mich., has been doing for almost a decade. In 2005, a group of anonymous donors launched an ambitious program. They pledged enough money to pay the tuition of most students who graduate from the district's public high schools to attend any of Michigan's public universities or community colleges. The effort, called the Kalamazoo Promise, has spent about $50 million assisting more than 3,000 students from the city. One of them, Erica Adams, was a high school sophomore when the program launched. She's since graduated from Michigan State University and is now a foster care specialist for the state of Michigan. Adams and Kalamazoo resident Michelle Miller-Adams, author of a book about the program, The Power of a Promise: Education and Economic Renewal in Kalamazoo, both spoke with NPR's Michel Martin about how the program has changed how students and educators think about opportunities beyond high school. Adams: Back when I was going to school, before the Promise was announced, teachers weren't really asking, "Well, what school are you going to after graduation," or, "What are you going to major in?" It was, "What are your plans after graduation?" Whereas now, it's teachers telling you, "What school are you going to?" So it completely just changed the mindset that I think a lot of our administrators have — our educators and our kids have — in our community. Miller-Adams: That's even happening at the elementary school level. I have a daughter who's been in Kalamazoo Public Schools elementary school for about five years. And, yeah, that college-going culture and attitude and expectations penetrates all the way down to kindergarten. Adams: I think it kind of just lets all the kids know, too, that there's somebody out here that thinks that I'm worthy of having this education, regardless of my family situation [or] what class we are. The stipulations for the Promise are not, you have to have a 3.5 GPA and all these extracurricular activities. You have to just have the willpower to do it, and that's pretty much it. And I just think that that's an amazing blessing, that somebody or a group of people put that much faith in this community. Miller-Adams: We ... see a great deal of freedom that students are experiencing in being able to follow their passion and, most importantly, graduating with either no or very low levels of debt. ... And that opens up a huge range of possibilities. That opens up the possibility of graduate school for a lot of students. So the impacts are really pretty subtle and nuanced. I also probably [would have studied] nursing or something like that, just because I know those are jobs where typically ... you can find jobs easily. ... So when the Promise was announced, I was like, "Big 10 Universities, here I come!" And they were also seeking to make Kalamazoo a more attractive place for people to live and work, especially those people who value education. They wanted to make Kalamazoo "stickier." That's a term we hear a lot — harder to leave, more welcoming to come to. Miller-Adams: Yeah, I think that's one of the surprises that we find in the data. I think that we will see it change. This is a very long-term program. It's set up to continue in perpetuity. And, you know, we're only really eight years into it in terms of eligible classes. The reality is that we are still a very high-poverty district in a high-poverty city. And kids ... experience tremendous stresses. And so it's not that none of those kids can overcome those. But it is a lot harder for those students to really stay in school, be successful and make full use of the Promise. Lots of them are trying.